Bruce Chatwin was a truly singular voice in British travel writing, and whose silence is now all too apparent. Since his untimely death in 1989 of what was described at the time as a rare Chinese disease (but which was later admitted to be AIDS), several collections of his previously unpublished work have appeared. The latest of these is Anatomy of Restlessness: Uncollected Writings. This book, however, pays poor service to his name. Published under the auspices of a “sourcebook” of uncollected work it draws together various pieces from magazines and journals. The result is a misshapen assemblage that hides gems amongst the weak and the substandard. Chatwin’s writing at its best is both thrilling and absorbing, capable of carrying the reader to untravelled lands, and Chatwin was always the best of companions. However, if Chatwin the writer was intriguing, Chatwin the man was so much more. His rich life, pushed and pulled by his demanding interests, was always present in his work. That is not say that he was example of that breed of traveller who batters you into submission with endless anecdote heaped upon anecdote. Rather, he introduces you to the sights of exotic lands, vast parties of characters, all set free to live an existence untrammelled by the author’s irrepressible ego. As the format of this new book suggests, Bruce Chatwin’s writing was divisible into distinct categories – whether it be art, his exploration of what he termed “the nomadic alternative”, or fiction, written in a style which was an assiduous blend of the real with the imaginary. The autobiographical piece which opens Anatomy of Restlessness hints at some of the myths that surround this man. By all accounts Chatwin left his steady job writing for the Sunday Times with a telegram enigmatically stating “Have gone to Patagonia”. This, however, was not the first time that he had made such a dramatic break from security. Previously, he threw in his job as a director at Sotheby’s in order to live with and study nomadic tribes in the Sudan, offering the excuse that his doctor said that he needed to view distant horizons in order to correct an eye defect (a self confessed psychosomatic illness). The product of his sudden trip to Patagonia was the aptly titled In Patagonia (1977). This first book was most probably the driest of all Chatwin’s output, but which has already been raised to near classic status. Chatwin weaves together curious observations with nuggets of historical information which manages to make this more than an account of a physical journey, and that, to me, is the essence of good travel writing. I don’t just want to know what a cracking guy the author is, and how he managed to get out of a scrape with an armadillo whilst travelling in the Amazon with just a piece of used dental floss and a very, very sharp stick. Nor do I want to be laden down with superfluous information on the economic argument for the downfall of the Ottoman Empire! What do I demand from a travel writer then? I want to be able to understand them as a person, and know why they have undertaken this particular journey. And that means being able to step inside their head and travel with them. Though this is nearly impossible, Bruce Chatwin was one of the few writers that I feel managed it. Chatwin was not, however, a straight forward kind of travel writer like Wilfred Thesiger or Norman Lewis. One of the most amazing qualities that sets Chatwin apart was his ability to mix fact and fiction in his ‘stories’. As he said himself, “The word story is intend to alert the reader to the fact that, however closely the narrative may fit the facts, the fictional process has been at work.” This is idea is best held in mind when considering his best-selling book, The Songlines (1987). Though clearly a novel, it is also not a novel. Let me explain. The main character is a guy called Bruce who’s travelling around the Australian outback researching the nomadic culture of the Aboriginal, and their singing the world into existence through their travelling of the Songlines. This coincidence is further compounded by the fact that ‘Bruce’ records his notes in very same moleskin notebooks that Bruce Chatwin himself was famous for. This book, then, results in being so much more than just a travel book or a novel. It provides not only a combination of a portrait of an amazing culture and a damn fine read; it eventually draws the reader into questioning the very fabric of human culture and our Western preconceptions. Who could ask for more? An interesting aside: Salman Rushdie, who travelled with Chatwin in Australia whilst he was working on this book, provides an enlightening, though brief, glimpse of Chatwin at work in his book Imaginary Homelands (1991). An obvious thread that joins much of Chatwin’s work like The Songlines and Anatomy of Restlessness is his passion for nomadic life. This interest is represented in both the opening section, ‘Horreur du domicile’, which draws together various short pieces on his own personal motivations to travel, and the chapter entitled ‘The Nomadic Alternative’. In this chapter the collection of pieces outline many of the arguments that comprised Chatwin’s own unpublished thesis on nomadism. These pieces, though frequently dense, are some of the most rewarding, with Chatwin’s erudition shining through. Chatwin links many divergent nomadic cultures from around the world, highlighting several similarities of development, and in time puts forward a credible case for nomadism as equal to the sedentary life that has become a universal norm. If Chatwin is to be believed, civilisation just took a wrong turn somewhere, and chose to plump for the inferior option. This, he feels, also goes some way to explain the Western disease: wanderlust. When viewed in comparison to his own collection of incidental work, What Am I Doing Here (1989), Anatomy Of Restlessness pales. Chatwin amassed innumerable fabulous pieces in what must be considered the definitive compilation, and which really renders this new book superfluous. The pieces range through the intensely personal in ‘Your father’s eyes are blue again’, the dramatic with ‘A coup – a story’ (though Chatwin himself was caught up in the coup in Benin), and the entrancing ‘On the yeti’s tracks’. These short works, however, are just the tip of the iceberg, with this book containing so much more. Another remarkable quality of Chatwin’s writing was his ability to capture a personality, and What Am I Doing Here is filled with accounts of some the unusual characters he met over the years. We meet Maria Reiche, a gangly German mathematician who spends her days in the bleak environment of the Peruvian Pampas, standing on a step-ladder in order to chart the strange lines, often miles in length, carved into the floor of this desert. We travel with Chatwin to Ghana to see the film director Werner Herzog going mad (again) whilst filming Chatwin’s novel, The Viceroy of Quidah (1980). We even get to trail around India with Bruce and the photographer Eve Arnold who followed Indira Gandhi’s election campaign shortly before her assassination in the late Seventies. Another crucial aspect of Chatwin’s output addressed in Anatomy of Restlessness is his unfailing interest in all forms of visual art. Chatwin’s aesthetic was that which championed the primitive and the simplistic, though, whilst at Sotheby’s he was employed as an ‘expert’ on Impressionism. Whilst interested in the theory of art and collecting, he was also an artist of considerable aplomb himself with his work being published in the posthumous Photographs and Notebooks (1993), with a coinciding exhibition at the Royal Festival Hall, London. Here we are shown his remarkable eye for the abstract that exists in all things. Sparse and controlled, his photographs managed to trap the beauty that can be found in the common and everyday. He crops boats and walls in Mauritania, so releasing the power of their dazzling colours and geometric forms. The prayer flags of the Bodnath Stupa, Kathmandu, are framed so as to cut crazy patterns in the sky. 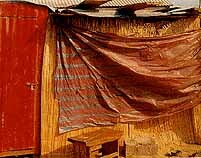 Chatwin’s photographs also demonstrate keen awareness of the decay inherent in all life, littered with images of crumbling buildings, and tatty ramshackle shacks, all breathing what looks to be their last breath. Maybe he liked feel that all sedentary life was on its last legs, and soon nomadism, the rightful king would come and claim back its lands. Or maybe he just found them beautiful. This brief excursion through the work of Bruce Chatwin has, I hope, served to demonstrate not only his uniqueness, but also convey some sense of the power of his writing. 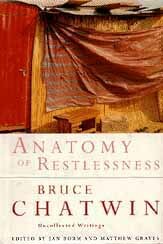 In doing so, it becomes glaringly apparent that Anatomy Of Restlessness is an unsatisfying epilogue to Chatwin’s ouevre. Yes, it is put together in a good accessible form, and yes, it does aim to cover the main areas of his output. However, what is lacking is a sense of quality, and as a result much of this work falls short of being able to be considered ‘important’. However, if, like myself, you want one last chance to experience the joy of reading a new Chatwin book, then you won’t be disappointed. Bruce Chatwin does still exists in these pages.